Constructing environmentally friendly buildings and realizing sustainable development, as we believe, remains an unstoppable trend as well as an unavoidable choice for global construction. In practicing such a belief, we aim to provide a cozier and healthier space for clients, while conserving energy during the entire process. In property construction, we conserve energy, water, materials and save space during the entire process from design to construction. Likewise, same requirements are exercised in systems of construction, mechatronics, and landscaping. In providing property services, we target green operations while ensuring that the space becomes cozier and healthier for clients whilst increasing efficiency. We encourage green practices in daily life, including recycling, paper saving, and the utilization of environmentally friendly materials. 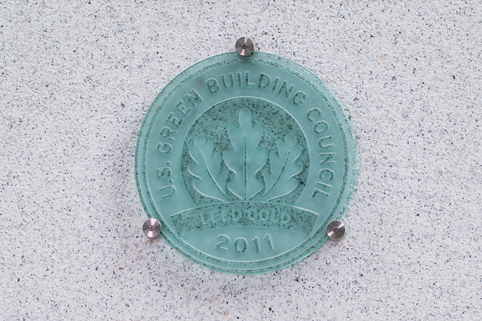 Gold Accreditation of LEED CS; Platinum Accreditation of LEED EB; BOMA 5-Certifacte of Excellenc Accreditation, and nomination for TOBY (China’s first office building to have won these two honors). 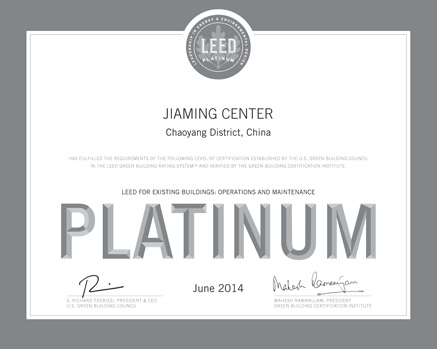 The cultural and creative industry center located along Beijing’s west 4th Ring Road is a candidate for Platinum accreditation of LEED CS; the office building of the JIAMING-LONGYUAN project is a candidate for Gold accreditation of LEED CS.